Anyone who’s ever had to slog through truckloads of log files will see Paglo’s utility instantly. With its intuitive search interface and comprehensive set of data analytics, this screenshot will make admins mouths’ water. Paglo is an example of a strange new beast that we’ll probably be seeing a lot more of: a pure cloud-based management tool. To get started, simply download the open source Paglo Crawler to your network and it will get start gathering data from WMI or syslogs and feed them back to an individual index on Paglo’s infrastructure. Paglo CTO Chris Waters said the idea for Paglo sprang from seeing the ubiquity of search (everyone know how to use a search engine, right?) and applying it to the user demand they saw for log management. 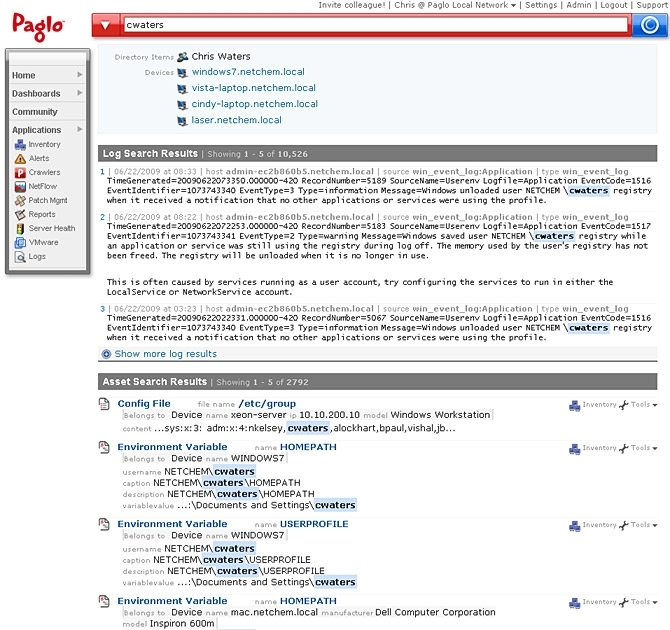 Aside from its bravura log search tool, Paglo also has a fairly standard set of MSP features that will be familiar to any IT pro, including performance and network monitoring, and patch management for Windows. It’s thin on other standard features, though, like remote desktop access or remote control. Clearly, it’s biggest strength is the way it aggregates network information.